The second phase of the £5.3 million M60 Denton Island pinch point project – delivering safer, less congested journeys around junction 24 of the motorway – will start tonight (Thursday 3 July). The Highways Agency is delivering the improvements at the junction roundabout where the motorway meets the M67 and the A57 local road – a key commuter route into Manchester city centre. This project is improving safety and vehicle flows at one the busiest motorway junctions in the region, delivering a boost to the local economy and people’s journeys. We will be working hard to minimise disruption to drivers and to local residents but some overnight closures – of the roundabout itself as well as the M67 and A57 - will be needed and we urge drivers to check traffic conditions before setting out on journeys. The first phase of the project - including providing more room on both exit slip roads onto the roundabout from the M60 and a dedicated left turn for drivers leaving the anti-clockwise M60 for the Manchester-bound A57 - started in November and opened to drivers in April. The second phase includes remodelling the westbound approaches to the roundabout from the M67 and A57. More than 100 yards of both carriageways will be merged to form the A57(T) and allow new arrangements for traffic heading onto the roundabout for the clockwise and anti-clockwise M60 as well as the A57 into Manchester. Some 24 hour lane closures on approaches to the roundabout. Short sections of the A57 local authority route - both to the west and east of the roundabout - also subject to overnight lane and full carriageway closures. Drivers are urged to check traffic conditions before setting out on journeys. 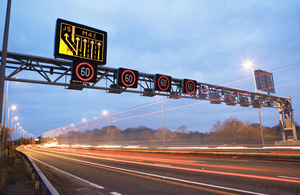 The Highways Agency provides live traffic information via its website www.highways.gov.uk/traffic, local and national radio travel bulletins, electronic road signs and mobile platforms, such as the iPhone. Local Twitter services are also available at @HAtraffic_nwest and @HAnew_nwest. Devised with support from Tameside Council and representatives from the local community, the Denton Island scheme is the first to be delivered in Greater Manchester in the Government’s national £317 million pinch-point programme designed to help stimulate new development and local economic growth by improving road safety and tackling congestion bottle necks. In all, 28 projects, worth £66 million, are being delivered across the North West.